The Terms and Conditions of Use set forth herein apply to the entire group of web sites owned, operated, licensed or controlled by Waterways Ireland. Waterways Ireland sought input from the private sector and the product offerings available on www.headintotheblue.org is operated by individual private sector businesses. 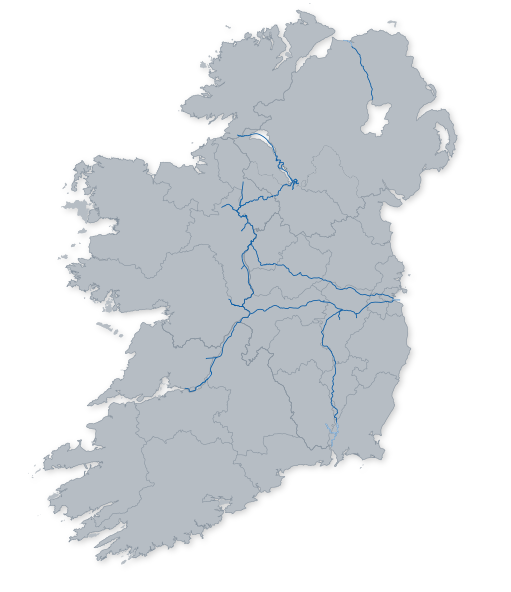 The services and offerings available on www.headintotheblue.org are simply listings and Waterways Ireland has no input and therefore bears no responsibility for the actual offering which takes place. By accessing and using these services you accept and agree to these terms and will deal directly with individual businesses relating to any concerns or queries you may have with the offerings available on this site. Be received by the deadline of 20th February 2019. Include a title and subtitle: Online customers favour offers that have clear titles e.g. Family Paddling Paradise - A half day paddle on the Shannon Blueway for a family of four or River Shannon Escape - A short break on a six berth cruiser on the Shannon from €763. Have a set price: Offers with a set price produce a much higher conversion rate than generic 'X% off' packages. Customers unfamiliar with the product have no figure from which to subtract this percentage and are inclined to drop off. Have a clear description: Market research shows that offers which combine a sense of place and unique experiences have a much better click-through conversion rate, this can be created with a inspiring description of your product that captures your offering and makes it stand out from the crowd. Have a high resolution image: An image must be submitted for the offer to be accepted. It should be landscape in orientation, minimum size 1mb, maximum size 3mb with a resolution of 72dpi. Use original photo files with no borders, markings, image credits or image editing. Formats accepted include jpeg., eps. or tiff. format. The image must be named with your property/business name. Be family orientated. This campaign is set to focus on the 'Connected Family' market, the product should reflect this. Have a booking function: Offers will not be accepted from providers who do not have a clear method of booking, e.g. online booking or contact number. Have a validity date: Offers with no validity date will not be accepted. Be compliant with GDPR legislation. Any and all personal data you used/gathered in order to submit and promote an offer must be compliant with GDPR legislation. Waterways Ireland will not be liable for any personal data breach relating to the use and/or gathering of such data for the use and promotion of your offer during this campaign. Waterways Ireland is not obliged to accept all, or any prizes or familiarisation trip offers. Waterways Ireland reserves the right to allocate the prizes offered to the most appropriate media channels in our judgement. Any and all personal data you used/gathered in order to take part in a prize and/or familiarisation trip must be compliant with GDPR legislation. Waterways Ireland will not be liable for any personal data breach relating to the use and/or gathering of such data for your participation in a prize or familiarisation trip relating to this campaign. Waterways Ireland cannot guarantee that all adverts submitted will be included. The deadline submission of artwork is 8th March 2019. All artwork must be received before the deadline. All adverts will be placed in a random order. Waterways Ireland will raise an invoice for payment in advance of advert publication. Any and all personal data you used/gathered in order to take part in the advertising of this campaign must be compliant with GDPR legislation. Waterways Ireland will not be liable for any personal data breach relating to the use and/or gathering of such data for your participation in advertising during this campaign.